Mekong Peace Journey is a learning process which consists of regional training on peace building and internship for the young adults who come from from Cambodia, Thailand, Vietnam, Myanmar, Laos, China MP was organized by Reginal Strategic Team (RST) – Meking Working Grip for Peace. This program is designed to provide opportunity to young adult leaders from Mekong region to overcome political, historical and cultural complexes and also to be competent to assume a relevant role and contribute to the development of civil societies which upholds non-violance, equity, sustainable peace, respect and cooperation. 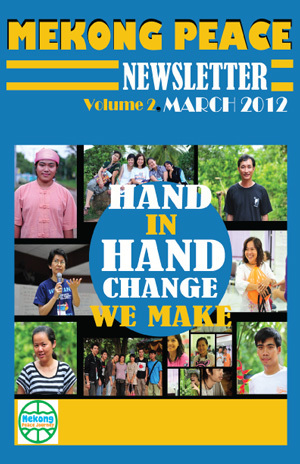 Young adults are invited with belirf that, they are the Agent of Change: the present and the future of Mekong region.